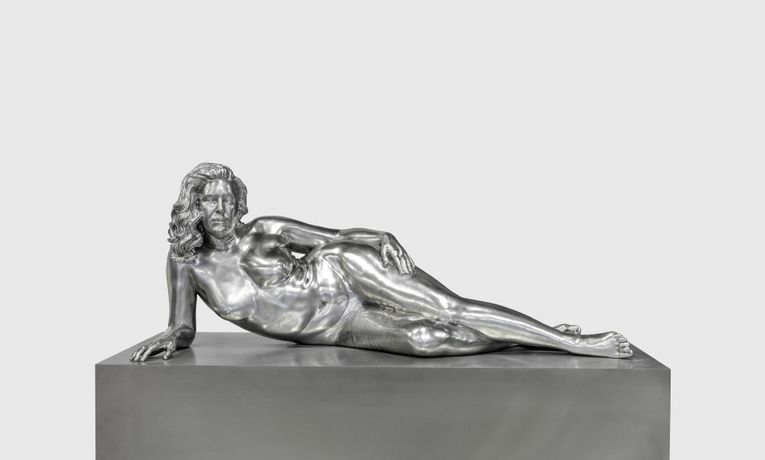 Charles Ray, Reclining Woman, 2018, Forton, 29 1/2 x 73 x 35 1/2 inches; (75 x 185 x 90 cm). Matthew Marks is pleased to announce "Charles Ray: three rooms and the repair annex," the next exhibition in his galleries at 522 & 526 West 22nd Street. The exhibition includes five new sculptures. Ray has divided the larger gallery, 522 West 22nd Street, into three rooms and installed a single sculpture in each one. Reclining Woman (2018), in the center of the main room, is machined from solid stainless steel. Presented in a relaxed pose on a rectangular steel base almost at eye level, the figure is slightly larger than life-size. The subject’s body has not been idealized, and every detail, from the toes on her feet to the mole on her cheek, is carved with a directness matched by her frank facial expression. The scale shifts in the room at the back, where Mountain Lion Attacking a Dog (2018) is on view. This hypothetical scene from the hills around the artist’s home in Los Angeles is cast in sterling silver and is three and a half feet long and less than two feet high. The smaller scale encourages viewers to lean in and examine the detailed surfaces of the animals’ muscular bodies. The third sculpture, A copy of ten marble fragments of the Great Eleusinian Relief (2017), is machined from a solid block of aluminum. It is based on a work in the Metropolitan Museum of Art, an amalgam of Roman marble fragments embedded in a plaster cast of the ancient Greek original. Next door at 526 West 22nd Street are a pair of small-scale sculptures, Mechanic 1 and Mechanic 2 (2018). The sculptures depict the same figure in two different poses: one removes the wheel rim from an automobile tire while the other crouches and watches attentively. Both are made from machined solid stainless steel that has been painted in a matte white finish, which highlights the details on the sculptures and gives them an almost porcelain-like delicacy. Charles Ray (born 1953) lives and works in Los Angeles. His work has been featured in Documenta (1992), the Venice Biennale (1993, 2003, 2013), and the Whitney Biennial (1989,1993, 1995, 1997, 2010), and his sculptures have been the subject of two retrospectives. The first was organized in 1998 by the Museum of Contemporary Art, Los Angeles, and traveled to the Whitney Museum of American Art, New York, and the Museum of Contemporary Art, Chicago. The second was held at the Kunstmuseum Basel and the Art Institute of Chicago in 2014-15. "Charles Ray: three rooms and the repair annex" is on view at 522 & 526 West 22nd Street from May 3 to June 16, 2018, Tuesday through Saturday, from 10:00 AM to 6:00 PM. For additional information, please contact Stephanie Dorsey at 212-243-0200 or stephanie@matthewmarks.com.